Have you ever used an ear pick? Maybe you didn't know, but there are different types of earwax. I learned this when I was around 18. Asians and most of the world have a 'hard' crumbly earwax, while Americans or Europeans have a more soft and 'waxy' type. For the first time, I found an ear pick supposedly catering to both of these types. Let me back up a minute. 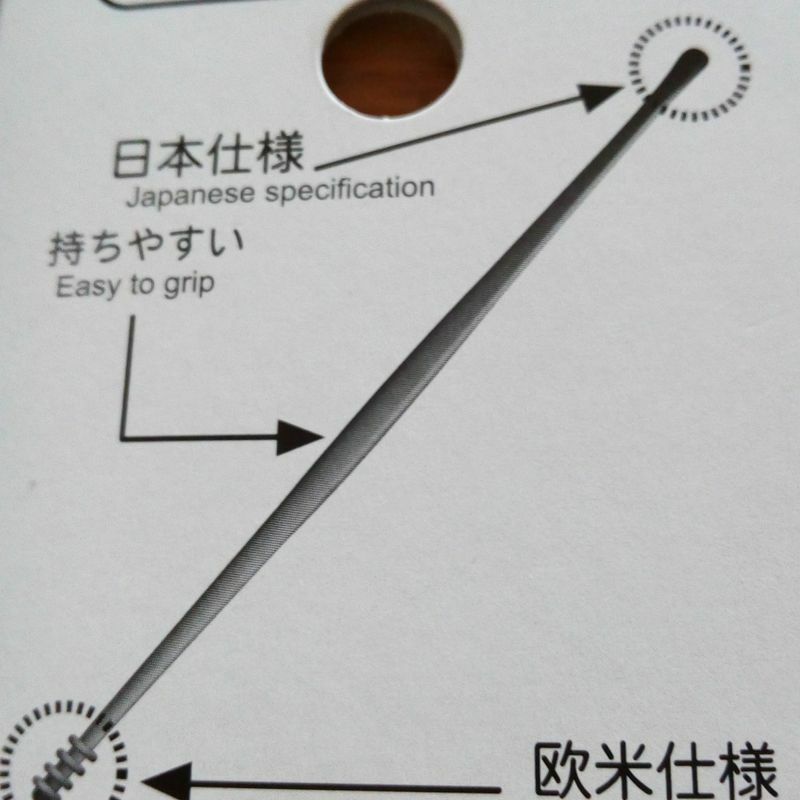 For Years, I've been using one of the typical Asian bamboo ear picks, which is like a teeny long spoon with a fluffy feather or a little figure at the other end. You use the spoon end to (very shallowly – no bumping inside the ear because that hurts a lot) scoop out any earwax. I like it a lot better than using disposable cotton buds, which I grew up using. 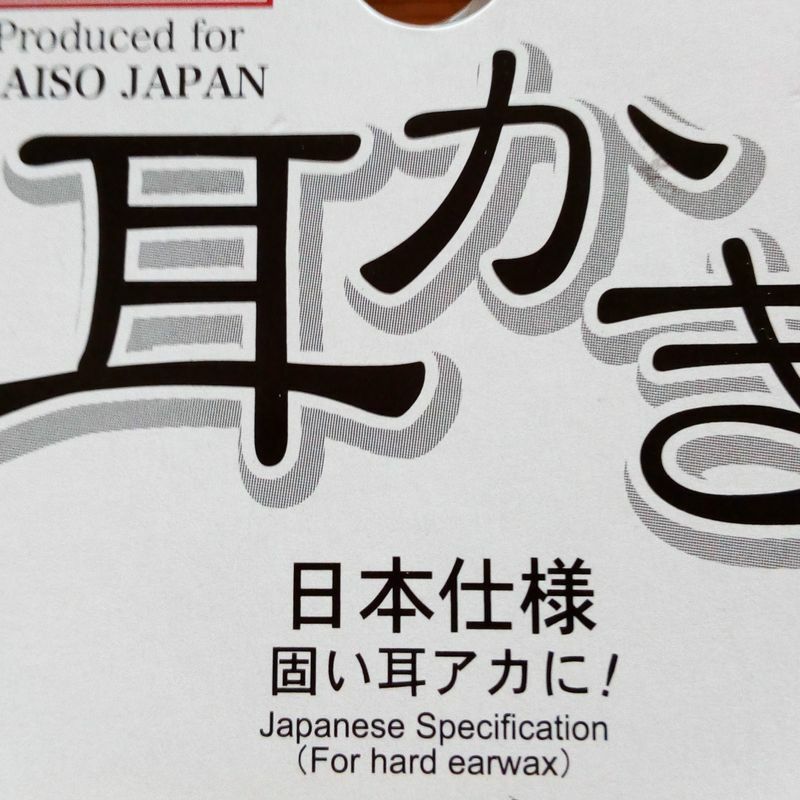 While my routine is using the mimikaki (literally: ear shovel) after showering and I get some water into my ears, there is mostly waxy earwax and it works just fine to scoop it out. One of my Asian friends actually uses tweezers to pull out earwax because it's that solid. 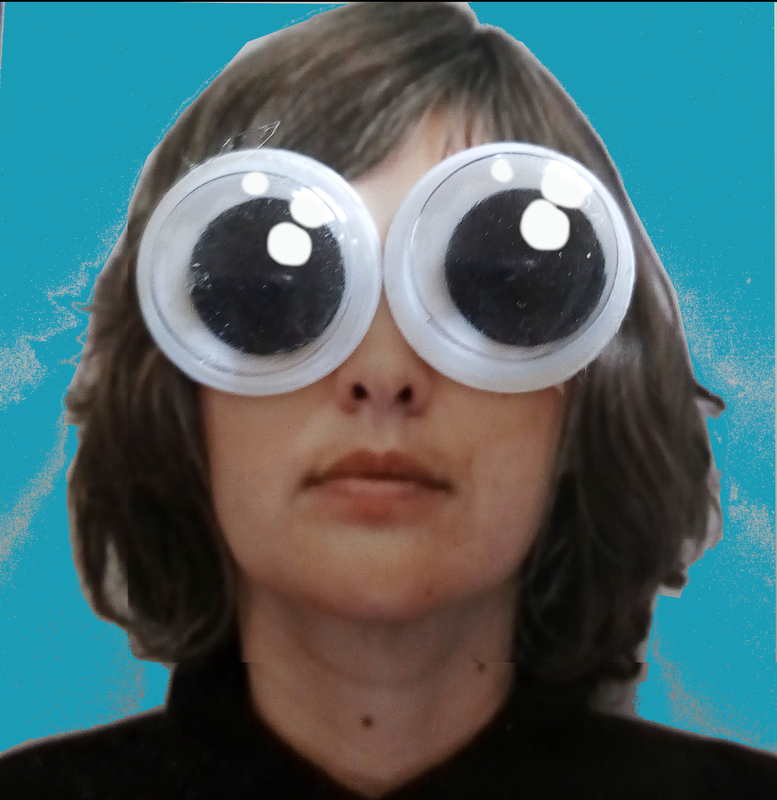 Anyway, that's gross enough for now. My previous bamboo mimikaki was accidentally broken because it was sticking up while I closed a drawer on it. I set out to find a replacement from the local super-drug store and noticed that A: only packs of two were sold, B: they were made in China, and C: they were 250 yen and up (for two). I opted to check the Daiso instead. Sometimes Daiso actually sells products made in Japan and I thought they might sell just one individual mimikaki. There were way too many options (I think around ten?) for mimikaki. Most were made in China and almost all were in packs of two. (Why is this? Do people buy two because they are easily misplaced? I don't get it.) The mimikaki were mostly made of bamboo; some were lacquered in black or pink. A few options were metal (plated nickel) or plastic. I don't feel happy about plastic, but I decided on the plastic option (a two pack) I guess because that way they wouldn't break easily. They are made in Japan, and I like that they're shorter and more portable than the previous one. 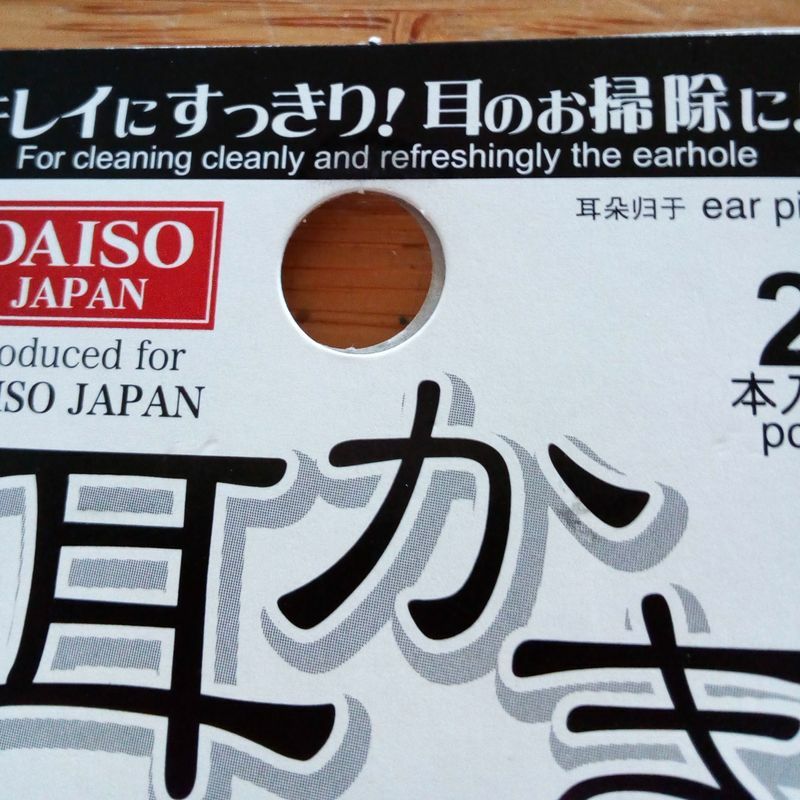 I think what may have sold me is the Engrish on the pack I chose. Also, this is the first time I've seen this design of mimikaki. One end is the traditional scoop I'm used to (for Asian hard earwax) and one is like a honey spoon design (for European 'small' earwax). 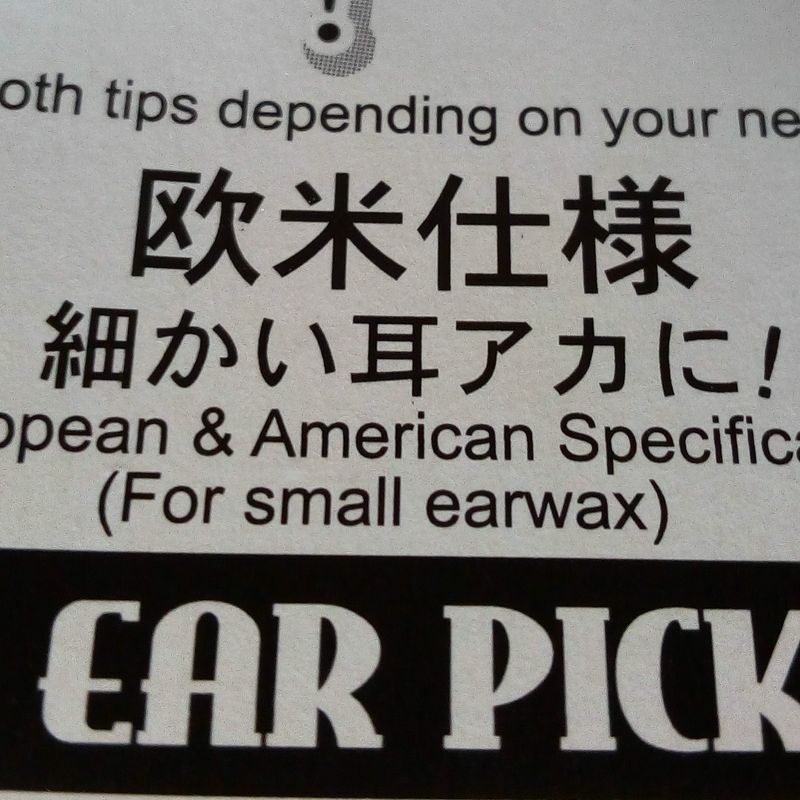 I'm not sure what small earwax means or why they chose that shape. I didn't find it to be effective at all. To be honest, I don't really like the scoop end as much as my bamboo mimikaki either. It's a little more pliable, which may be kinder on the inside of my ears, but it isn't as solid or effective feeling.